This page contains recent SAADI newsletters and updates on the latest news. Keep an eye on this page for details of competition results for SAADI gymnasts For up-to-date information you may also wish to follow the SAADI Facebook Page. Congratulations to all the girls who competed at Club Championships last weekend! You put on a great show. Our 2017 all around champions were Emma (Senior), Natasha (Bedford Cup), Clara (Junior), Isabella (Novice), Hannah (Intermediate), Emily (Improvers), Abigail S (Development Novice) and Abigail L (Burgess Cup). Well done to all the girls on a great competition. Thanks to Jim for the photos. Click Read More to see photos of all of the groups. 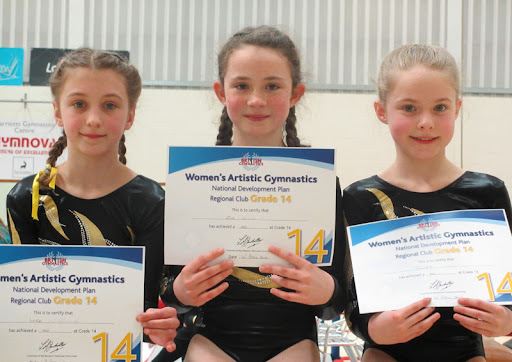 Congratulations to our level 7 gymnasts who competed in the county level 7 competition at Marriots yesterday. Gemma came 4th on vault, Eve 3rd on vault and Bethany was 2nd on vault and floor, and came second overall. Great results, well done girls! Congratulations to all the SAADI girls, who did really well in the Hertfordshire club and regional grades competition today. We were really proud of the girls' results: Grade 6 Lilly, Clara and Betsy (distinction), Bethany, Charlotte, Katie and Leila (all commended). Grade 5: Isobel and Isabella (both commended). Grade 4, Julia (distinction), Natasha (distinction/2nd place), Lucy (commended/3rd place). Grade 2: Emma (distinction/2nd place), Holly and Juliet (both commended). Congratulations to all of the gymnasts! Congratulations to all the gymnasts who competed in the HGA Grades Competition yesterday, all the SAADI gymnasts did really well and passed their grades. In HGA 1 Francesca, Isabel, Olivia and Hannah did well in their first county competition for SAADI, with the highest placing being an impressive 5th on bars from Francesca, out of 53 gymnasts competing. In HGA 2 Emily, Ella, Orla and Lois also did SAADI proud, with Emily finishing 3rd on Vault, and Ella close behind in 4th. Ella had the highest overall score for SAADI finishing in 9th place of 26 gymnasts. Finally, in HGA 3 Leila, Betsy, Charlotte and Eve had a very good competition, with Leila coming in 1st place on bars, and Betsy close behind in 2nd, Charlotte got 3rd place on floor, and Eve did particularly well in her first competition representing SAADI. Well done everyone! HGA 1 Gymnasts Isabel, Olivia, Hannah and Francesca with their certificates. HGA 2 Gymnasts, Orla, Lois, Ella and Emily with their certificates. 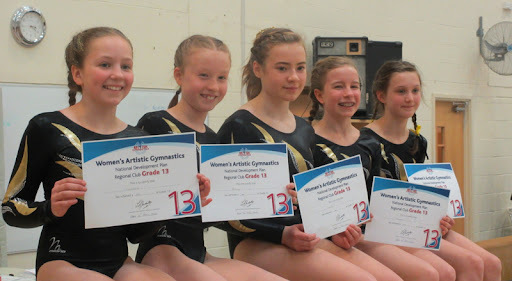 HGA 3 gymnasts, Leila, Charlotte, Betsy and Eve with their certificates. SAADI girls did us proud in the Herts Novice and Intermediate competitions today at Marriotts. Robyn, Ella & Emily competed in the Novice Competition and all did great routines, Emily won a bronze medal for vault. In the Intermediate competition Hannah age 11-12 won gold floor and bronze beam. Annabel age 13+ won silver vault, silver beam and bronze floor. Lara age 13+ won bronze vault, gold beam, gold floor and silver bars. Well done girls!!!! Congratulations to the girls who competed in the county levels competition: in level 5 Natasha and Ellie and Juliet G competed well with Juliet placing second on floor. In level 4 14+ Lauren was third overall, third on vault, second on bars and first on beam, Juliet C was third on beam and floor and for age 12/13 Emma was third on vault. 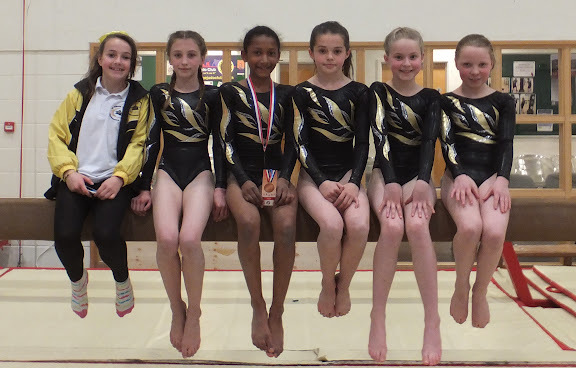 Great news from this weekend's level 6 & 7 teams competition: SAADI are Hertfordshire Level 7 team champions! Congratulations to Paige, Katie, Lilly and Charlotte, who took the title, producing some very strong vaults. Our level 6 team of Lilly W, Isobel, Clara and Julia also vaulted well, and finished in 6th place overall against some very tough competition. Well done to all of the girls! 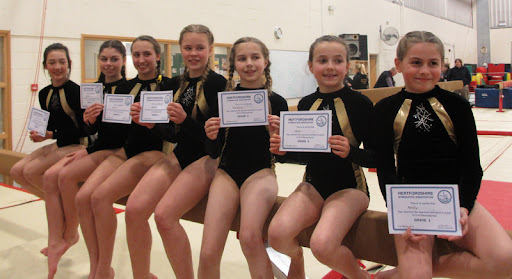 The Hertfordshire NDP competition grades took place at Marriots on Sunday and SAADI were represented well by 11 of our competitive gymnasts who all passed their respective grades. Five SAADI gymnasts took part In the first round, grade 6, which is the first grade gymnasts compete in. Julia competed in the age 8 category and did really well to pass her grade at such a young age, she will certainly be a superstar of the future. Hannah and Kate competed in the age 9/10 category and both got good scores, Hannah passed her grade with Distinction scoring over 58 points all around, and came in third place on vault and 5th on beam. The final two grade 6 gymnasts competed in the 11+ category and as the only competitors in their age group for this grade were also awarded gold and silver medals all around for their performances. In the afternoon some of our more experienced gymnasts took to the floor in the competition for the higher grades. In the grade 5 competition age 12+ Lara and Juliet both did well and passed their grade. Emma competed in the regional grade 4 competition 11/12 age group and achieved a distinction overall and third place on vault. Holly, Laura and Lauren competed in regional grade 3, Laura and Lauren took first and second place on vault respectively and Laura also came third on bars and beam. Holly came first on range and conditioning which is an excellent result showing that she has been working very hard at home on her conditioning. SAADI's final competitor of the day was Lucy, competing in the very difficult regional grade 2. Her best results came on floor (first place) and range and conditioning (3rd place), she passed the grade easily, missing out on a distinction by just 0.05 marks, but overall had a great competition. Well done to all the girls and thanks to the coaches and judges for their vital support. The spring edition of the Hertfordshire Grades competition took place at Marriots in Stevenage on Sunday 15th of February. Several of SAADI's youngest competitive gymnasts entered the grade 1 competition, representing the club for the first time: Emily, Ella, Tiffany and Sophie. All SAADI gymnasts performed really well, depite being younger than many of their competitors: all passed their grade 1 and enjoyed their first experience of county competition. Sophie won the trophy for the highest bars score out of all 38 gymnasts competing, from clubs all over Hertfordshire, which is a fantastic achievement. She also came in 9th place overall for this grade. Ella and Tiffany received their best scores of 11.8 and 11.65 respectively, on the vault; whereas Emily's best score was 11.9 on the bars. Well done to all the girls for doing so well in their first county competition, we hope to see them build on their success in years to come. The HGA 2 competition saw some of SAADI's more experienced gymnasts take to the floor, in a competition that involved 31 gymnasts from clubs across Hertfordshire. All of the girls passed their grade 2 and gave some very polished and confident performances. Lilly and Paige were ranked joint 5th overall, with Lilly achieving 4th place on vault and 5th place on bars; whilst Paige came 6th on vault and 8th on bars. Millie was also high up the overall rankings, coming in 7th place, with impressive 5th and 4th place finishes on vault and bars. Maizy did particularly well on the beam, achieving the second highest score of the day on that apparatus, and also tied with Millie for 5th place on vault. Katie did particularly well on bars, coming in 6th place with a score of 12.75, whilst Isabella, SAADI's youngest HGA 2 competitor, had a consistent competition all around, achieving her best score and a respectable 14th place on the vault. SAADI would like to say a special thank you to Nicola for being our judge at the competition and to the coaches for supporting the girls in their competition preparation and for taking them around on the day. The 37th Annual SAADI club championships took place this weekend, and a total of 37 gymnasts competed across six categories. This year saw the return of the club championships to the end of the summer term a move from the pre-Christmas timing of the last few years. The standard of the competition this year was really high, with the gymnasts performing excellent routines on all four pieces of apparatus: vault, bars, beam and floor. 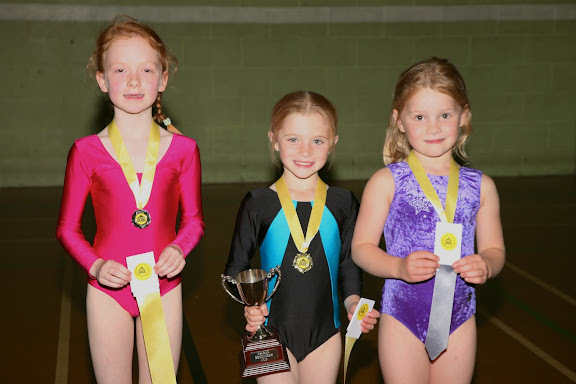 The youngest gymnasts, competing for the Burgess Cup, remained on good form from last week's success at the Hertfordshire Grades competition. These girls performed the HGA grade 1 routines, and many even managed to improve on the excellent scores they achieved last week. The overall winner in this category was Lilly, with Elisa in second place, and Paige in third. Ella and Emily, two of SAADI's youngest gymnasts were competing the HGA routines for the first time in competition and won gold and silver in their age group. 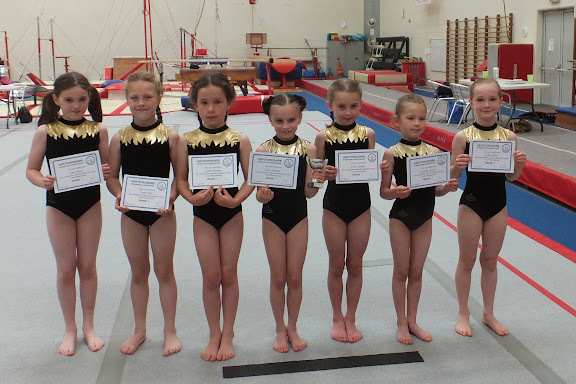 The development novice group were also boosted by their success last week, again with many gymnasts improving their scores. Kate took first place in this category overall, Lucy was second and Sophie came third. The final group performing HGA grades routines were the Improvers, all the girls in this category achieved very good execution scores across all pieces. Sarina yet again gave almost flawless performances on vault and floor, and took the overall title in this category, Sylvie took second place and Elanor was third. 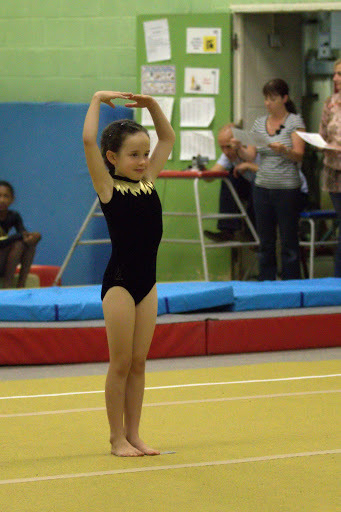 In the novice categor y the gymnasts performed the challenging level 6 routines. For many of these girls it was the first time they incorporated tumbles into their floor routines: back flips or front somersaults, and they performed these well. The girls did well on all four pieces, showing the skills they have worked hard to develop over the last year. In this group Natasha took the gold medal overall, Ellie the silver, and Hannah the bronze. The junior competition was based on level 5 rules, challinging many of the girls in this category to step up their difficulty beyond level 6, which they competed earlier in the year. Emma took the overall title in this category, as well as first place on all four pieces of apparatus with consistent well-executed routines; Juliet performed well to take silver overall, and Katie took bronze overall having only recently moved up to this group. The senior girls showed impressive moves on all pieces of apparatus. They finished with some great performances on floor to round off the competition, with all eyes upon them; inspiring the younger gymnasts who were gathered around to watch and impressing the audience. The overall winner in the senior category was Louise, Lucy took second place and Laura was third. As well as the gymnas ts, who put on a fantastic show, there were many other people whose help was crucial in making the day run smoothly. Club leader Penny Collins put a huge amount of work into pre-competition organisation, and making sure that everything ran smoothly. We are also grateful to the judges, who had the tough job of separating the performances and did a good job of scoring the competition fairly. Of course we must not forget the coaches who work hard with these gymnasts every week to help them to develop and improve their routines. Finally, thank you to all the parent volunteers who took on various roles on the competition day to ensure that it ran smoothly. We hope you enjoyed the competition as much as we did, and look forward to welcoming you back next year! 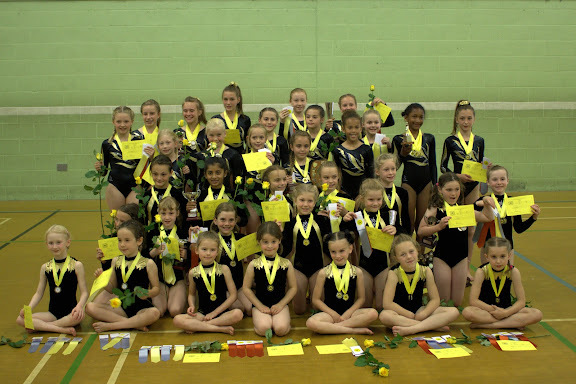 This weekend SAADI gymnasts competed in the Hertfordshire Grades Competition at Marriots in Stevenage. The gymnasts performed their routines in front of an audience of spectators as well as a panel of eagle-eyed judges. The judging panel for this competition was particularly distinguished: it included two international judges, who have both judged at the Olympics, a member of the national women's gymnastics technical committee and all remaining judges were qualified to regional level. There were two rounds of competition, the first being for Grade 1. This was the first competition for all of these gymnasts representing SAADI against other clubs and competing against many girls who were much older than them. All seven of the girls did really well, and everyone passed their Grade 1. Elisa performed a beautiful floor routine, and was rewarded with the highest floor score of the day and the Margaret Hayward Floor Trophy. She did well across all pieces of apparatus coming in third place overall. Paige and Lilly both had a really good competition coming in 8th and 9th place respectively overall and tied for 4th place on vault. Isobel came 4th on bars, claiming SAADI's highest score on that piece of apparatus. Katie and Leila both got their best scores on vault, and gave confident performances on the other pieces. Isabella was SAADI's youngest competitor and achieved her Grade 1 at just six years old. Later in the day the HGA grade 2 competition took place, in which there were a total of 23 competitors from around the county. All 13 of SAADI's competing gymnasts performed well and passed their grade. Sarina had a fantastic competition coming in first place on three out of four apparatus: vault, beam and floor; her beautiful floor routine gained her the highest score of the whole competition, an impressive 12.95. SAADI's highest placed all around competitor was Elanor, who came in 3rd place overall, and took 4th place on the bars. Kate also did very well in the all around competition placing 5th overall. Very good individual apparatus performances came from Julia, 2nd place on bars; Sylvie 2nd place on beam; Lucy 2nd place on floor and Sophie 4th place on floor. Delphi, Amy and Clara all put in solid all around performances with their highest placings being on the bars. Olivia's best result was a 6th place on the beam, whilst Sarah and Ella gave their best performances on the floor and vault respectively. SAADI would like to thank all of the coaches who prepared the gymnasts for the competition, and took them around on the day and our regional judge David Callow for judging. Congratulations to all of the gymnasts who competed, you represented SAADI really well. 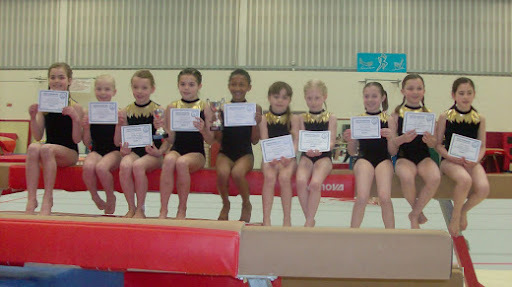 This weekend SAADI had two groups of gymnasts competing in the Hertfordshire Level 6 competition on Sunday. The competition involved clubs from all over the county, with a total of 43 gymnasts competing across different age categories. SAADI was represented in the age 9/10 category by Ellie, Isabella and Natasha. Ellie and Isabella were competing in their first external competition for SAADI and performed all of their routines well, Ellie achieved the highest overall score for SAADI and Isabella got the highest SAADI score on beam. Natasha was able to build on her experience of winning Hertfordshire Grade 2 earlier this year to perform some excellent confident routines and claim a bronze ribbon for level 6 bars. 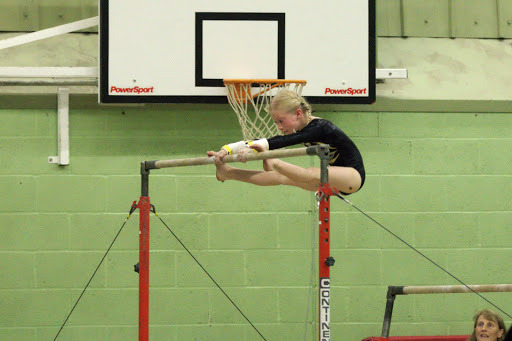 In the age 11/12 competition SAADI was represented by 5 gymnasts: Emma, Lara, Katie, Juliet Annabel. Abbie was unable to compete due to injury but she came along to support her team mates and contributed to the great team atmosphere the girls had in the competition. The girls performed really well, SAADI competition highlights included Juliet's 4th place on valut, Lara's 6th place on bars, Katie's 6th place on beam and Annabel's 6th place on vault. The best all around SAADI score was achieved by Emma Afari, who won the bronze medal overall, a bronze ribbon on vault and came in fourth place on Bars and Floor. Each club is responsible for organising one county competition per year, and this weekend's competition was run by SAADI. Special thanks go to all those parents and coaches who helped with scoring, music, announcing, judging and score sheet selling, all of whom were crucial to the smooth running of the competition. Thanks also go to our coaches who took care of the girls during the competition, and of course the gymnasts themselves who all represented us really well. The 36th Annual SAADI Club Championships took place this year on Sunday 24th November. The competition was once again a huge success, with gymnasts performing on the four pieces of apparatus: vault, bars, beam and floor. 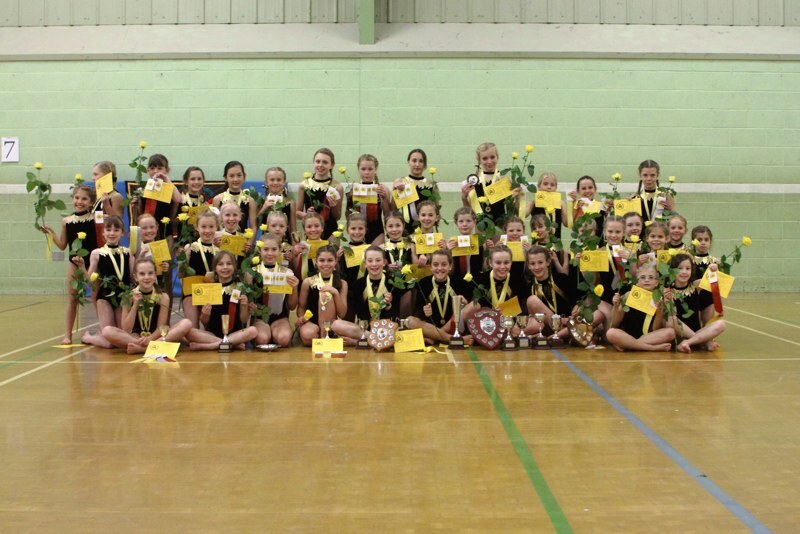 The competition was split into four categories: senior, junior, novice and improvers. Medals were awarded in each category for all around performance and ribbons for the top three places on each of the four pieces of apparatus. The girls have all worked really hard this year, and this showed in their excellent performances, with many of them receiving individual apparatus awards. The 2013 all round champions were: Lucy (Senior), Emma (Junior), Natasha (Novice) and Katie (improvers). SAADI would like to thank all parents, coaches and judges without whom the competition could not have been such a success and to congratulate all the gymnasts who performed. Click to read more see some photographs from the day, courtesy of Adrian Dixon. The county level 4 and 5 teams competition took place on Sunday October 20th and SAADI entered two teams of four gymnasts, one at each level. The girls performed well at the competition and were a real asset to the club. The team competition format allows four gymnasts to compete on each of the four pieces of apparatus: vault, bars, beam and floor, with the top three scores on each piece counting towards the team total. Every member of each of the SAADI teams contributed a score that counted towards the team total one at least one apparatus, showing that every gymnast really was valuable. All girls competed well, holding their nerve and matching the performances they are capable of doing in training for almost every routine, which is what they are striving to achieve. 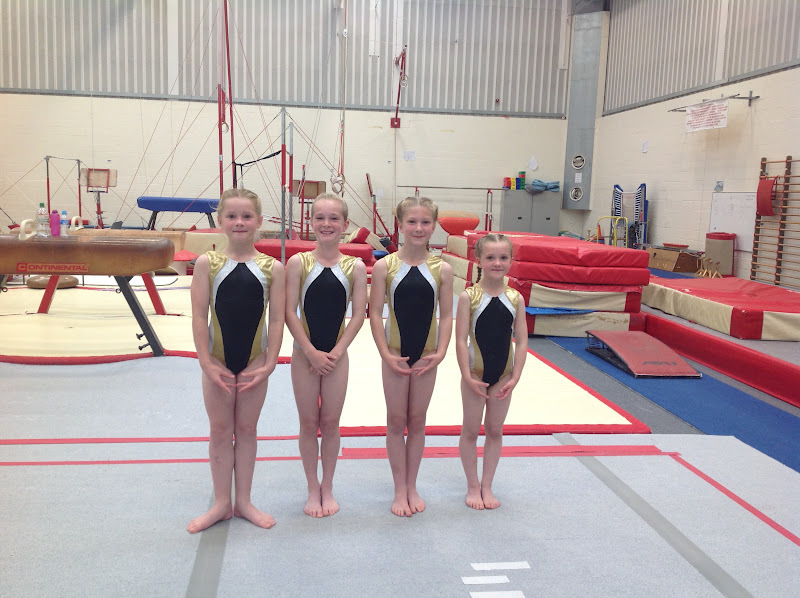 The members of the level 4 team were Olivia, Lucy, Megan and Louise. The team finished the competition with a score of 134.25 securing them seventh place. Olivia secured SAADI's highest scores on Vault (11.5), Bars (11.3) and Floor (11.95); Lucy equalled Olivia's high Vault score and also achieved the team's highest beam score (10.8) and overall all-around score (44.7). Louise had a very good competition, providing the second highest scores for the team on Vault, Beam and Floor and finishing a very close 0.2 behind Lucy in the all-around. Megan had a very consistent competition producing good scores across all apparatus, including a steady beam routine for 10.3 which was crucial for the team score. SAADI's level 5 team of Laura, Anina, Lauren and Juliet also did really well, finishing the competition with a score of 125.25 and fourth place. Laura achieved the highest all-around score for SAADI (41.6) and the highest vault score (11.15). Lauren Contributed the team's best Bars and Beam scores, achieving 9.55 and 10.55 on those pieces. Anina produced a very elegant performance for the highest SAADI floor score of the day (11.0) and also produced the second highest vault and bars scores. Juliet produced excellent beam and floor performances, producing the second highest scores on these apparatus, and tied with Lauren for the second highest all-around score within the team. Newly qualified SAADI judge Nicola Fuller was judging at this competition, her first since qualifying as a judge in September. SAADI would like to congratulate her on this accomplishment and thank her for her work at this competition, without judges it would not be possible to hold competitions. We are also very grateful to the coaches who have worked with these girls recently: Annie Fuller, Penny Collins and Nicola Fuller, whose hard work has shown in the performance and excellent conduct of their gymnasts. Congratulations to all the gymnasts who took part in the competition, and thank you for representing SAADI in such a professional manner. The 2013 SAADI Beginners' and Development Club Championships took place on Saturday June 29th. All the girls performed really well, in front of an audience of family and friends, and of course the competition judges. For many of the girls this was their first competition, and they did really well to learn the Hertfordshire Gymnastics Associate (HGA) Grade 1 floor routine and polish it up to competition standard. More experienced development gymnasts competed all four pieces: vault, bars, beam and floor, again performing HGA 1 routines. 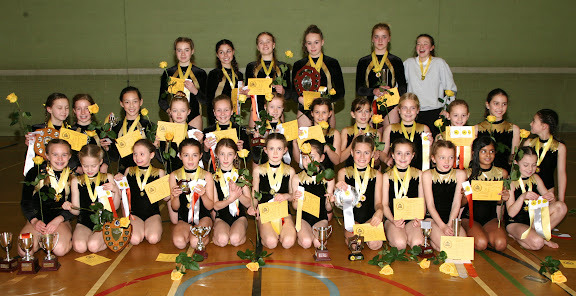 At the end of the competition each gymnast was presented with a yellow rose, in the SAADI tradition as well as a certificate containing their scores. Well done, from the club and all the coaches, to all the girls who competed. The beginners competed in four groups with bronze, silver and gold ribbons being awarded to the top three gymnasts in each group. 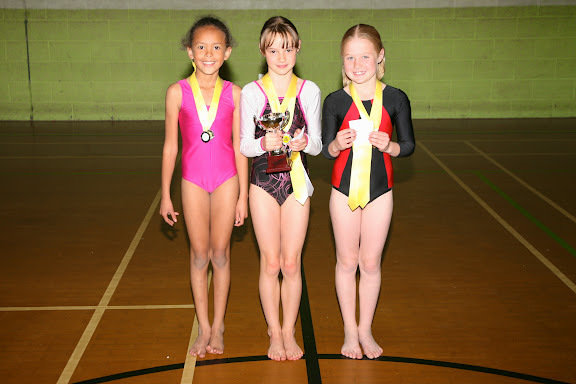 The overall medallists in the Beginners' category, with the highest scores across all groups, were Phoebe (gold), Amy (silver) and Clara (bronze). In the Development category, gymnasts competing four pieces, there were four groups of gymnasts: this time there were gold silver and bronze ribbons for each piece of apparatus for each group, and an overall medal for the group based on the total score across all four pieces. Medals were awarded to the overall winners with the highest total score across all groups, the gold was won by Eleanor, silver by Isabella and bronze by Ruby. Of course the competition couldn't happen without the hard work of the many people involved in organising and running it. A huge thank you to Penny Collins for organising the event; to the judges who marked every single performance; to the parents who helped out on the day; and to the older gymnasts and coaches who took the competitors around the competition floor. Click read more to see a gallery of photographs from the day, by Adrian Dixon, including photos of all of the groups and gymnasts with their medals and ribbons. 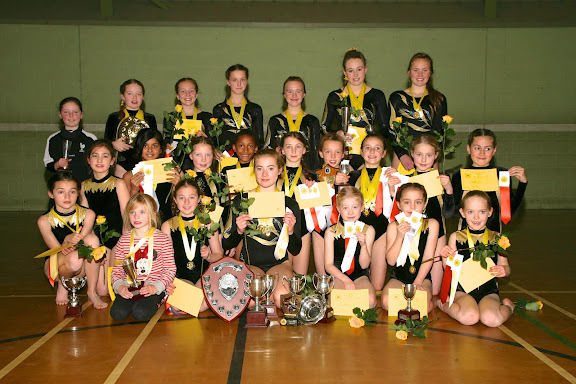 SAADI Gymnasts competed at the NDP Grades Competition at Marriots this weekend and all girls passed their grades. Zoe (8/9 years), Juliet and Lara (10+) started off the day for SAADI in the grade 14 competition, all three did well and have passed their first NDP grade, well done to them. Later, Lauren, Holly, Laura, Anina and Lucy all passed grade 13, performing some very nice routines on all pieces. Anina and Lucy achieved distinctions overall, and Lucy won third place on Floor and Beam in the 11+ category. 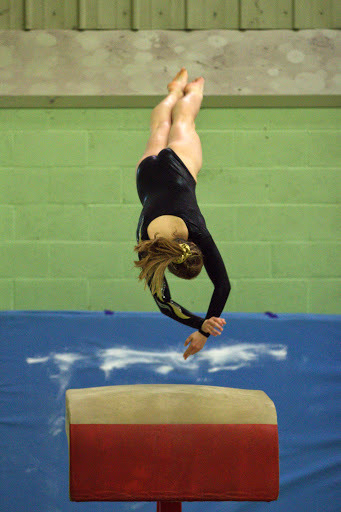 The final SAADI gymnast to compete was Louise, in the grade 11 (12+) competition. Louise came 5th overall in this competition and placed 2nd on beam, finishing the competition with a distinction. The girls all looked very smart in what was the first competition in the new SAADI competition leotard. Congratulations to all the girls who competed, and many thanks to all the coaches and parents who helped the competition go smoothly. SAADI now has a new competition leotard thanks to members who participated in a leotard design competition. 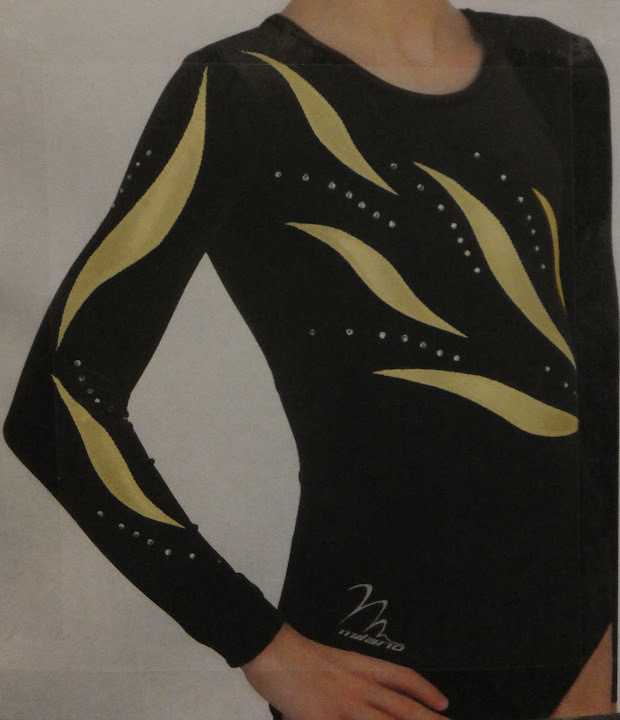 Gymnasts were invited to submit designs for the new club Levels and Grades competition leotard. The competition was a huge success with over 70 entries, of a very high standard. The winner, chosen to be the new competition leotard, and several runners up, were selected by the committee based on several criteria including: style, practicality and cost. The new competition leotard (right) was chosen as the closest Milano design to that of the winner, Louise. Congratulations to Louise and the runners up: Amber, Robyn, Georgia, Ellie and Megan. Thanks to all gymnasts who submitted designs: the committee really enjoyed looking at them all. Click read more to see the winner and runner up designs from the competition. The HGA competition, held on Sunday March 17th at Marriots in Stevenage, was a huge success for SAADII. In HGA 1 11 SAADI girls competed, all performing excellent routines. Gabriella, Hannah, Molly, Katie, Emma, Natasha, Elizabeth, Elise, Mia, Carmen (pictured below) and Sarina all passed their grade in what was their first county competition, and indeed their first time competing against other clubs, congratulations to them all! Out of 39 competing gymnasts Emma took first place on bars and won the bars cup and Katie was first on floor winning the floor cup. Molly came second on vault and was in second place overall (the sum of the scores on all four pieces). Sarina achieved third place on floor. SAADI also had success in the higher grades. Abbie, Molly, Georgia C and Madeline passed HGA 3 with Georgia taking first place on vault and Abbie third place on floor. Megan took first place on vault, floor and overall in HGA 4 as well as silver on bars and beam. Kasia shared the honours with Megan winning gold on the other two pieces, bars and beam and silver on vault, floor and overall. Finally, in the highest grade HGA 5 Georgia M took the overall title, coming first on vault, beam and floor and second on bars. 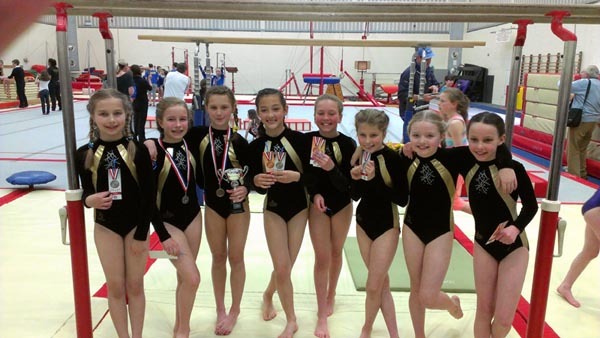 Well done to all gymnasts who competed, you were a credit to the club. HGA 1 Competitors, thanks to Lorrayne Lane for the photograph. Click read more to see photos of the cup winners with their cups. The Summer Term Newsletter for 2012 has been published. Please to download the newsletter in PDF format. Congratulations to the SAADI Gymnasts who competed in the Level 6 competition at Marriotts this weekend. The group brought home a number of medals and ribbons: Level 6 age 9-10 Ellie (Bronze, Floor), age 11-12 Madeline (silver, beam), Isabella (silver, vault), Georgia (bronze, vault and silver, bars), Lauren (gold, vault and bronze, bars), Laura (silver all around, gold, bars and bronze, floor) and Anina (gold all around and gold, beam). A gallery of photos taken at the 2010 SAADI Championships. Thanks to all who contributed, and especially the gymnasts, for a fantastic day! Click read more to see all the photos.